As any real estate agent or lifestyle programme will tell us, garden makeovers can add not only charm but value to a property. 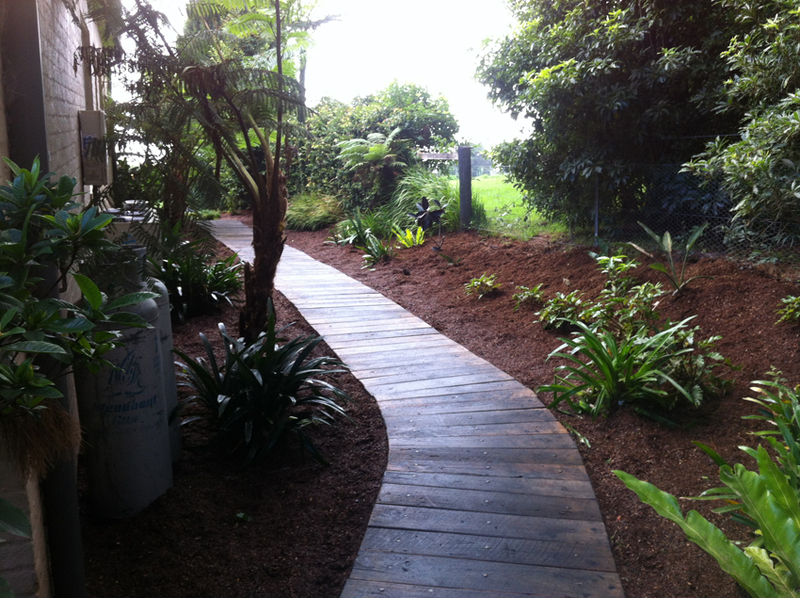 I was recently contracted to landscape a previously inaccessible area down the side of a client's house. 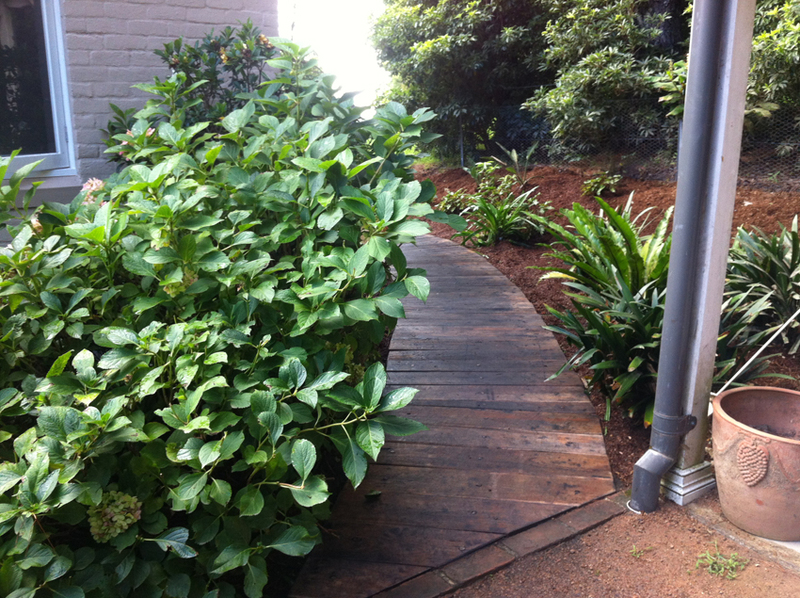 I constructed a steel and hardwood timber path which is not only functional and long-lasting, but also complements the character of the house. 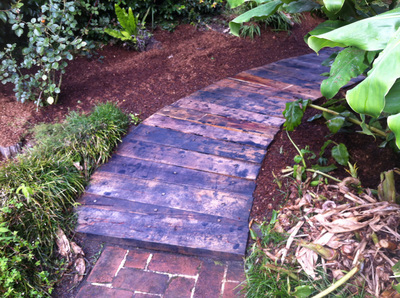 Mulching on either side of the path, around existing plants, completed the look. If you have an area around your house that requires attention, I'd be happy to discuss your needs. I’ve been busy doing hedging for a number of clients recently. This prompted me to think about what makes for a good hedge? Regular trimming without doubt encourages thick foliage and dense growth. Leaf size is an extremely important consideration when choosing a hedge. The lower the hedge, the smaller the leaf you will want to keep the hedge looking “tight”. Popular hedges (by their common names) include: photinia, viburnum, box, murraya and lilly pilly. These varieties are hardy and flourish with regular pruning. I’ve just spent a good part of my day removing the spent flower heads of in excess of 400 Agapanthus at a client’s property just outside Berry! (Removing the flower heads prevents undesirable seed propagation.) These evergreen plants with narrow, straplike leaves provide a colourful display of blue to purple or white flowers every summer. Agapanthus are particularly impressive when used to line garden borders or massed on sloping hillsides. They are generally hardy, low maintenance plants which thrive in full sun or part shade. They can be readily propagated by dividing expanding clumps. The perfume of wisteria heralds the arrival of spring. As a deciduous climber, wisteria provides interest in the garden all year round, with a mass of lilac to white flowers in spring, beautiful green foliage in summer to autumn and a bare vine in winter. Wisteria requires full sun to flower and responds well to shaping. Throughout summer, when new growth leaders appear, prune them back 20-30cm from the main leader. This will promote flowering the following spring and ensure that your climber is not a tangled mess by summer's end. In late winter/early spring, magnolias provide a spectacular and colourful floral display. Magnolia x soulangeana (Saucer magnolia) is a deciduous tree which grows to a height of about 5m. Its tulip-like pale pink and white flowers appear in August- September before the leaves. This magnolia works well as a feature plant in lawns or in garden beds. It enjoys full sun to partial shade and will benefit from a good supply of water in summer. A smaller but nevertheless spectacular magnolia is Magnolia stellata (Star magnolia) which grows 2-4m high. It has small white, fragrant, star-shaped flowers. It provides a real impact when several are grouped and planted in garden beds. Both these magnolia species are pest and disease-free. Winter is the ideal time to feed roses. Add horse, sheep or cow manure, blood and bone or a commercial rose food after pruning your roses in June or July. Additional manure and compost can be added throughout the growing season. 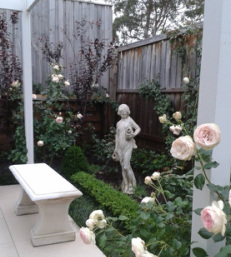 Feeding roses, coupled with regular pruning, are the best means to ward of pests and diseases. Roses require little watering and do not tolerate humidity, so they thrive in a hot, dry summer. Winter is a great time to be out in the garden! 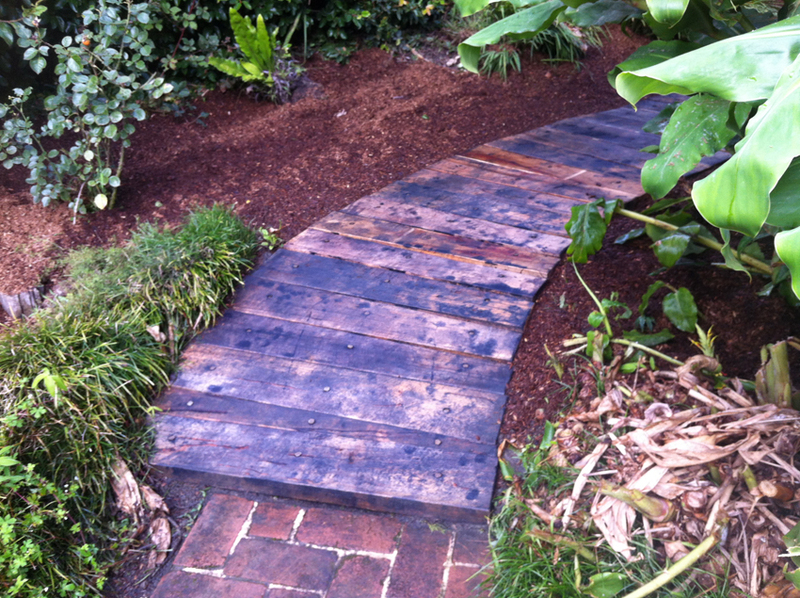 One of the most important tasks is to be weeding garden beds then mulching in preparation for spring. If you're time poor or would like some assistance with this task, please contact me to discuss your needs.